Where do I take my parents? More and more, oral health care is playing a greater role in maintaining our aging population. It has become vital to older patients as it relates to their overall global health. While effective preventive measures exist for younger populations (water fluoridation, dental sealants and parents), no preventive measures have been devised to address the expected increase in oral health needs of the aging population. Given the issue, yours or your parent’s oral care may need a prosthodontist and her team. Oral health conditions affected 3.9 billion people last year, and untreated caries in permanent teeth was the most prevalent condition evaluated for the entire Global Burden of Disease Study (global prevalence of 35% for all ages combined). Oral conditions combined accounted for 15 million disability-adjusted life-years (DALYs) globally, implying an average health loss of 224 years per 100,000 population. DALYs due to oral conditions increased 20.8% between 1990 and 2010, mainly due to population growth and aging. In 2015, the US population increased to 320 million (3.08 million in 2010) and 14.7% of the population will be aged 65 years or older. Our Right Smile team has taken a leadership role in the delivery of health care services to the seniors who deserve to be treated with the best oral health care we have to offer. Dental Insider ranks our practice as the only “10” out of 10 in the Sandy Springs area. In our offices, Dr. Scheinfeld is the prosthodontist specializing in geriatric care. With Dr. Orland’s and Scheinfeld’s nursing home experience, the Right Smile Team (including in-house periodontal treatment and implant placement) is designed to treat our aging population. Call for an evaluation of your oral health care needs. Sandy Springs Dental: The future of Implant Dentistry is here now. Dental implants are stronger and more durable than bridges, partials and dentures. And from an esthetic standpoint, they look and feel natural. 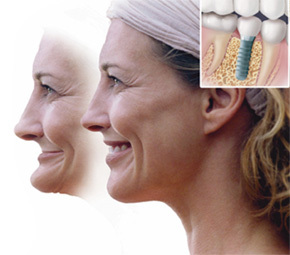 Implants offer you a permanent solution to tooth and continued bone loss. Additionally, implants may be used in conjunction with other restorative procedures for maximum effectiveness in that a single implant may serve to support a dental crown replacing a single missing tooth. Implants can also be used to support a dental bridge for the replacement of multiple missing teeth, and can be used with complete dentures, which increase stability and preserve bone structure. Modern advancements mean that a larger population than ever before are finding themselves candidates for dental implants. While the application and candidacy for implantation varies on a case by case basis, your dentist needs to determine the viability of implants as it applies to your actual bone structure. Keep in mind, prosthodontists are the ADA sanctioned specialists who have received post-doctorate training are most often your best bet for the successful completion of this type of technique sensitive procedure. If our team of implantologists can ever be of help please don’t hesitate to call or contact us so we can answer your questions. Dental implants preserve bone and improve your smile. It’s important to choose the right dentist to quarterback the implant procedure. Our dental implant expert has post graduate education specific to dental implants. This means she has 300 or more hours of postdoctoral or continuing education related to implant dentistry. Our dental implant expert is experienced. Dental implants are not “one size fits all.” They are complex, sophisticated dental devices, and you should expect our dental implant expert to have one or more years of experience in the practice of implant dentistry. Working in tandem with our resident prosthodontist, you can trust our implant dentist to give you the beautiful smile you deserve! Contact us for your complimentary consult to see if you are a good candidate for dental implants. Aging patients need special care. Elderly patients often experience a variety of dental issues specific to aging adults. The Right Smile Center offers in-house senior dental care in Sandy Springs from specialists who understand geriatric dental issues including those related to gum disease, tooth decay and the need for dental replacements. Medicare does not provide any coverage for dental services, and only 1 of 5 Americans aged 75 years or older has any type of private dental insurance. Dr. Scheinfeld, a prosthodontist, is ranked by Forbes magazine as the nation’s rarest professional specializing in geriatric dentistry in and around metro Atlanta for decades. And her daughter, Dr. Orland spends many hours traveling to numerous nursing homes around metro-Atlanta to provide the elderly with their much needed oral care. Our senior dental services are provided in a comfortable environment attuned to elder care. Our goal is to deliver highly individualized treatment to meet the unique needs of each patient. Call today to see about your loved one’s needs. Call for an evaluation of your oral health care needs. Although better than in years past, the typical aging patient’s baseline health state can be complicated by comorbid conditions (e.g., hypertension, diabetes mellitus) and physiologic changes associated with aging. Older adults may regularly use several prescription and/or over-the-counter medications, making them vulnerable to medication errors, drug interactions or adverse drug reactions. We take special attention to an aging patient’s medication. We have both in-house and out of practice pharmacological expertise we rely on. Potential physical, sensory, and cognitive impairments associated with aging may make oral health self-care and patient education/communications challenging. Dental conditions associated with aging include dry mouth (xerostomia), root and coronal caries, and periodontitis; patients may show increased sensitivity to drugs used in dentistry, including local anesthetics and analgesic. Our Sandy Springs team has the experience and expertise to handle yours or your family’s geriatric oral health needs. Older Patients need expert care. More and more, oral health care is playing a greater role in maintaining our aging population. It has become vital to older patients as it relates to their overall global health. While effective preventive measures exist for younger populations (water fluoridation, dental sealants and parents), no preventive measures have been devised to address the expected increase in oral health needs of the aging population. For oral care you need a prosthodontist. Oral health conditions affected 3.9 billion people, and untreated caries in permanent teeth was the most prevalent condition evaluated for the entire Global Burden of Disease 2010 Study (global prevalence of 35% for all ages combined). Oral conditions combined accounted for 15 million disability-adjusted life-years (DALYs) globally, implying an average health loss of 224 years per 100,000 population. DALYs due to oral conditions increased 20.8% between 1990 and 2010, mainly due to population growth and aging. In 2015, the US population increased to 320 million (3.08 million in 2010) and 14.7% of the population will be aged 65 years or older. While effective preventive measures exist for younger populations (water fluoridation, dental sealants and parents), no preventive measures have been devised to address the expected increase in oral health needs of the aging population. Our Right Smile team has taken a leadership role in the delivery of health care services to the seniors who deserve to be treated with the best oral health care we have to offer. In our Sandy Springs office, Dr. Scheinfeld is a prosthodontist specializing in geriatric care. The Right Smile Team, including in-house periodontal treatment is designed to treat our aging population. Call for an evaluation of your oral health care needs.